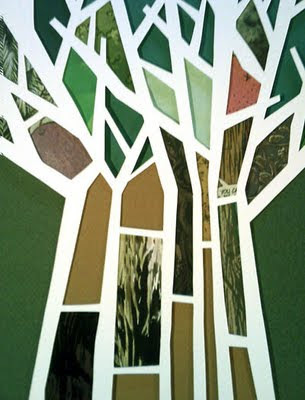 This is a blurry (sorry) detail shot of the "Tree of Knowledge of Good and Evil" I just cut for my upcoming show. In it you can see how I'm using bits of comics for background texture, as I'm doing in a lot of pieces for the show. The idea is using the mythology of comic books as a foil for the stories of the Jewish people. The show will be at the Merage Jewish Community Center of Orange County: "Paper Midrash: New Work by Isaac Brynjegard-Bialik." The opening reception will be from 2 to 5 p.m. on January 24, 2010.